Raj Vidya Kender was founded by individuals eager to help in the dissemination of Maharaji's message of hope and peace. 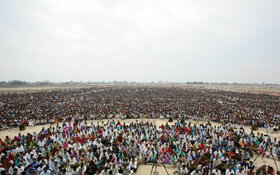 The society is dedicated to making Maharaji's message available to every person throughout the Indian subcontinent. Each day, from Kashmir to Kerala and from Assam to Karnataka, tens of thousands of volunteers organize more than 7,000 events in 3,700 centers in all the States to present Maharaji's message in print, audio and video. Each day, sessions are held where people are shown the techniques of Knowledge, a practical way which Maharaji offers for finding peace within. Each month, more than one million people in India enjoy watching satellite broadcasts of Maharaji's recent addresses in more than 4,400 centers. Maharaji's message is broadcast sixteen hours each day with translations into ten languages. 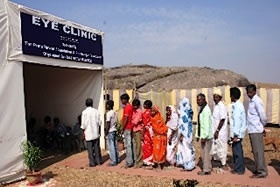 Raj Vidya Kender (also addressed Raj Vidya Kendra) which is active in almost all cities of India with major centers in Delhi, Jaipur, Ranchi (Bantoli), Hyderabad and Chennai, seeks to better the quality of life of people in need and regularly holds medical clinics where free medical treatment is provided. The organization is supported by voluntary contributions from people with an appreciation for Maharaji's message. Raj Vidya Kender was registered under the societies Registration Act in 1977, with registration No.8845/77. To leverage the resources to help people in need, The Premsagar Foundation India, a nonprofit public charitable trust, carries out various projects for the benefit of the poor and needy in India.